The Japanese Occupation ended in September 1945. In fighting the Japanese, the Americans had dropped the world’s first atomic bombs on the Japanese cities of Hiroshima and Nagasaki. The damage caused by these two atomic bombs was so devastating it caused the Japanese to decide to surrender. In Singapore, the surrender took place on 12 September 1945, at the Municipal Building (now known as City Hall). 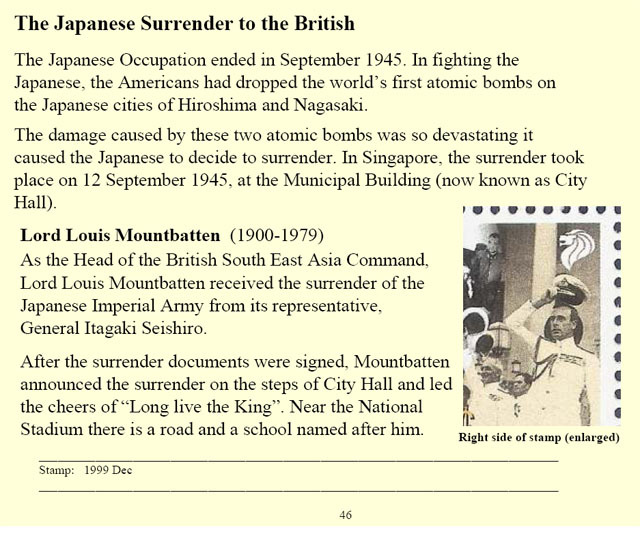 As the Head of the British South East Asia Command, Lord Louis Mountbatten received the surrender of the Japanese Imperial Army from its representative, General Itagaki Seishiro. After the surrender documents were signed, Mountbatten announced the surrender on the steps of City Hall and led the cheers of “Long live the King”. Near the National Stadium there is a road and a school named after him.